What if you were in Vegas, and a friend told you there was a slot machine in the corner that was giving out $119 for every $1 that was put in? You’d think the machine was broken, and that it was rigged. What if an investment advisor told you that he could get you $119 back for every $1 you gave him? That’s a 11,900% rate of return. Even Bernie Madoff only promised 10.5%. Obviously a scam, right? 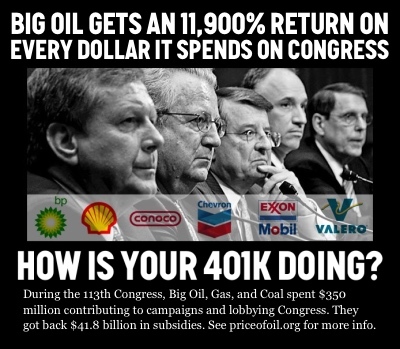 Clearly this is a scam, but if you’re the oil, gas and coal industry, it’s legal and business as usual in Washington. For every $1 the industry spends on campaign contributions and lobbying in DC, it gets back $119 in subsidies. Divide total subsidies by total money spent by the industry and you get 119. $1 in. $119 out. That’s a 11,900% return on political investment. Not bad. Influence is a tricky thing to measure. It is obvious to anyone that pays attention to US politics that the oil and gas industry is one of the most influential industries on Capitol Hill. But quantifying that influence is not always straightforward. At Oil Change International, we believe that the influence of the fossil fuel industry is the major barrier to a clean energy transition. We quantify that influence by tracking the campaign contributions that the industry makes to our elected representatives, and by looking at the amount the industry spends on lobbying. These measures leave out at least two major ways that the industry wields its influence: advertising and unregulated SuperPac spending. Because there is limited transparency on these measures we do not regularly track them. Nonetheless, we find that tracking campaign contributions is a reliable indicator of whether or not a particular Representative will vote to support the fossil fuel industry or a clean energy future. Finally, it is important to note that influence can often be much more subtle and less easily quantified. The well documented “revolving door” between the industry and government regulatory agencies is a very significant factor in setting policies that affect the industry.